Becky and Paul got married at the stunning Millbridge Court, Surrey, this summer. It was a wonderful wedding, with wildflowers everywhere and little film references on the tables. Becky got ready at Millbridge Court, in the beautiful room upstairs with her sisters, bridesmaids and mum, and there was such a happy vibe. The room has this super convenient little one way window, so Becky could have a little peep to see how the set up was going and guests arriving as she was getting ready. She wore a stunning Suzanne Neville silk gown, and looked so incredible. She then walked the short distance to get to the ceremony. 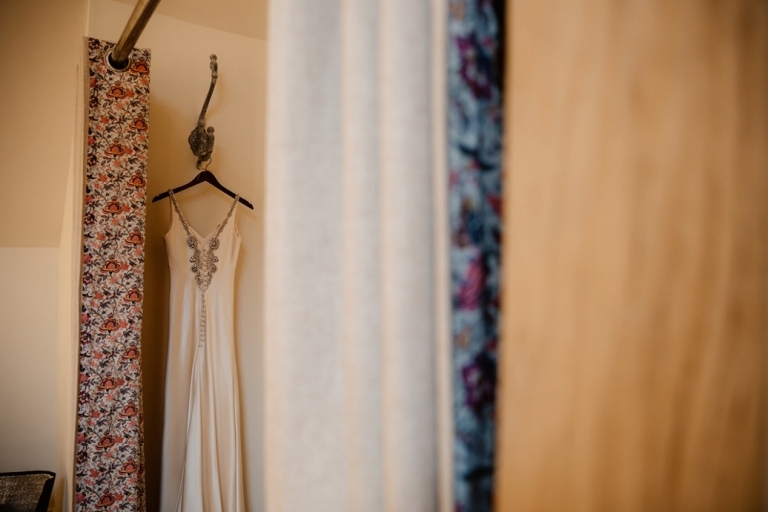 Paul got ready in another room at Millbridge Court with his best-woman and friends and as I had the wonderful Ania Oska Photography second shooting for me on this one which meant we could cover both bride and groom prep. 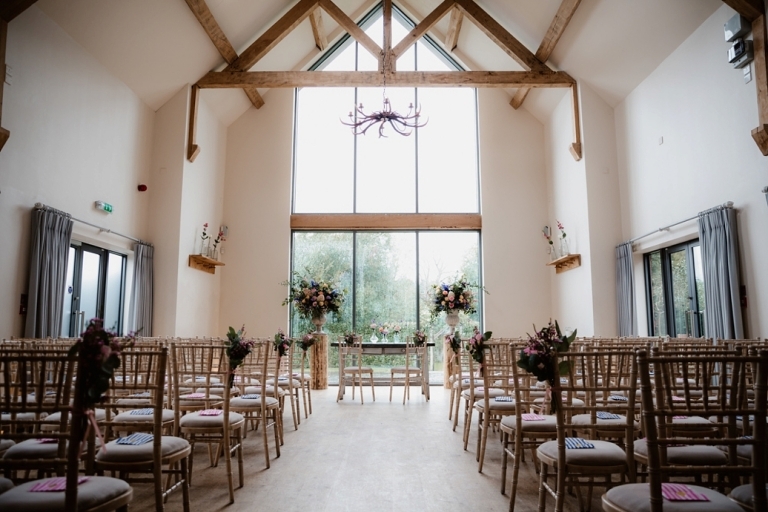 The ceremony took place in a beautiful room at Millbridge Court in Surrey. The ceremony area was filled with flowers, which was just stunning. 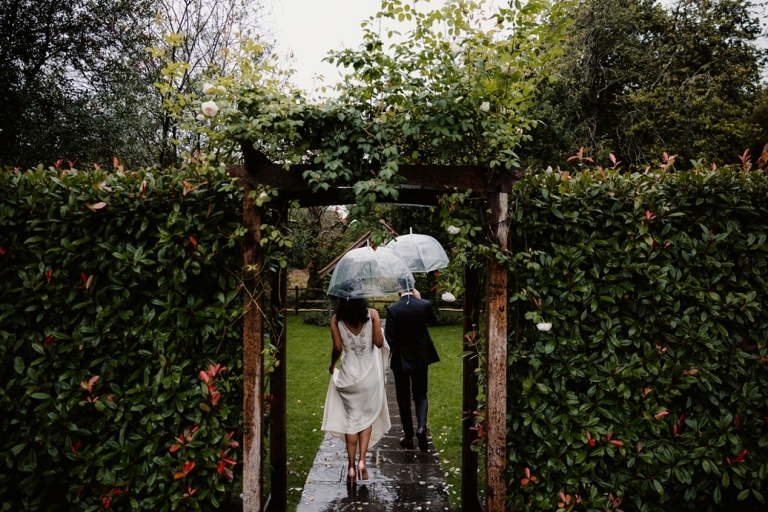 It rained pretty much all day, so although the gardens at Millbridge Court are beautiful, it was just as special being able to have the ceremony inside that lovely room with it’s large glass windows looking out. After the ceremony, we wandered around the venue doing portrait photos, which is such a great time for the newly married couple to have some time to let it sink in. I got some beautiful portrait photos outdoors – Becky and Paul were absolute rockstars and even though it was raining, still had the biggest smiles and were a joy to photograph. After photos the the couple mingled with their guests, which was the perfect time for me to get candid photos. Becky and Paul chose to have their wedding at Millbridge Court because it has so many options, and the light is gorgeous. 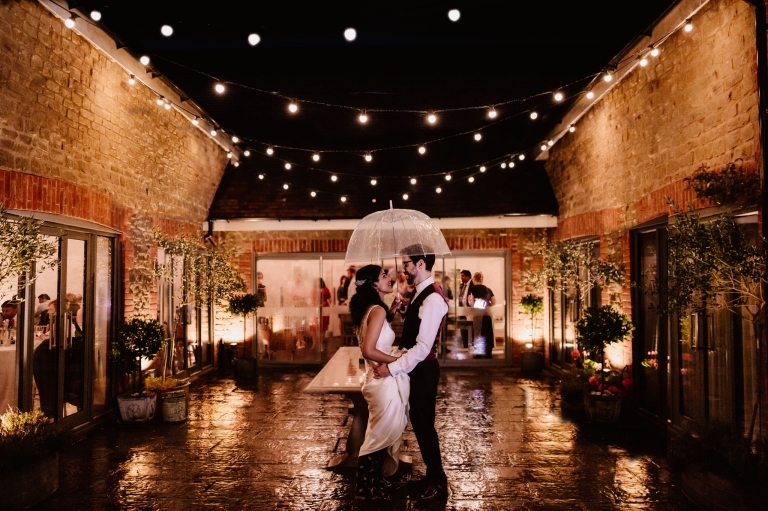 Millbridge Court is a stunning venue, and it’s got such a lovely feel to it, especially in the evenings when the the outside festoon lights come up and you can see everyone inside having a great time. We managed to sneak outside again once it had gotten dark (still raining) but it’s then that we got the magical shot of them stood outside the venue all lit up in the rain! After the cake cutting, they had their first dance, and the dancefloor was a very popular place to be. The DJ played all the best songs to get everyone dancing. I loved this beautiful wedding so much, honestly – if you’re worried about it raining on your wedding day – don’t be! It can make everything feel so much more intimate and magical. Thank you Becky and Paul for having me, you are both the best! If you’re getting married and looking for a millbridge court wedding photographer, get in touch.